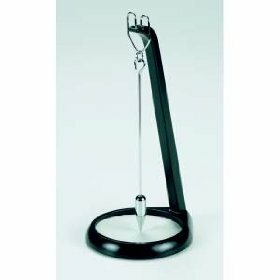 PIT & PENDULUM 23 Tall (NATURAL, BLACK or CHERRY ) [PIT&PENDULUM23Tall (NatBlkCher] - $54.95 : NewDaVincis.com!, Great Innovative Products, Gadgets and more. 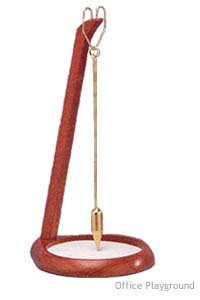 THE MOST POPULAR LARGE SIZE PENDULUMS ARE DESIGNED FOR THE CREDENZA BEHIND AN EXECUTIVE DESK, A COFFEE TABLE, OR AS A UNIQUE ACCENT PIECE IN THE HOME. PENDULUMS ARE 23' TALL AND ARE 9" IN DIAMETER. THEY ARE AVAILABLE IN A NATURAL, BLACK LACQUER, OR CHERRY FINISHE. 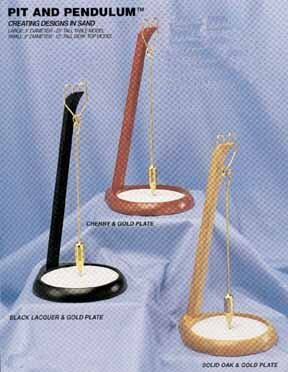 Metal parts areÂ GOLD PLATED for theÂ Natural and Cherry wood andÂ CHROME PLATED for the black lacquer finish.